HR management can be time consuming, so we provide breatheHR – a cloud-based, software solution that takes care of all your HR admin and task management so you can focus on growing your business. Built to ease the pressure on HR managers and small business owners, breatheHR helps you organise and handle all your HR documents in one secure, central place, that you can access at any time, from anywhere in the world. The system also enables your team to complete a lot of tasks themselves, like calculating holiday allowance, which saves you a job altogether. 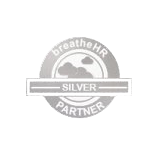 Access to breatheHR can be provided as part a retained package of support or on its own as a bespoke solution. Whatever option you choose, we’ll help you set the system up, select the features that are right for your team and spread the cost through monthly payments.